Krupuk (spells : kru-puk) is one of the most well-known foods in Indonesia. It is mostly served as a complementary food for breakfast, lunch and dinner and also is a favorite snack for Indonesia people. Its thin shape and rather hard but crunchy bite make people go crazy. 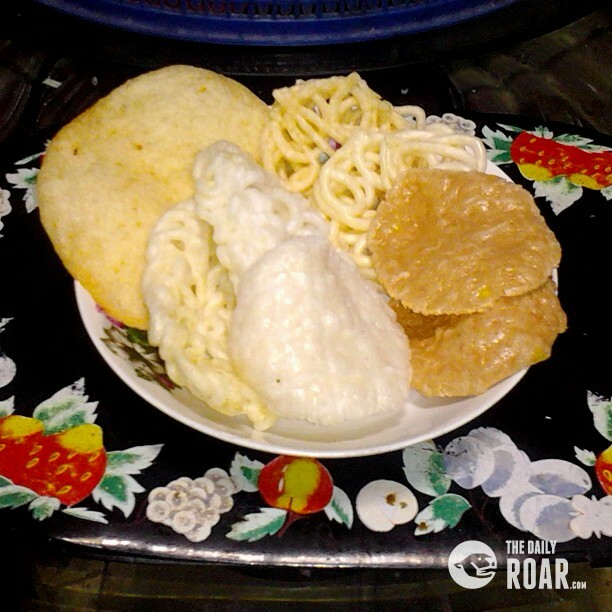 Krupuk has many different tastes because it is made by various sources of Indonesia’s nature. But also since it is sold in any kind of traditional food store, market or even in small to big restaurants. There are many kinds of krupuk in every region of Indonesia. And in every region the Krupuk is made in its own way with its own ingredients. There is a shrimp type krupuk, which is made from shrimp, sea fish, rice flour, egg & flour, or even with mushrooms. Making Krupuk actually is one of the easiest processes that you will every see. Prepare egg, flour, seasoning taste, and main ingredients such as fish, shrimp, mushrooms, or other main ingredients. The first step is to mix it together like you are making a cake. Just mix egg and flour with little water until it is formed as one sticky mass, then put it inside long plastic tray and wait until the krupuk dough feels rather hard. Then slice it up in pieces and dry it in sunlight for one day. After one day the only thing you need to do is fry it shortly. Krupuk is the best family snack that everyone will love! This traditional food is now being produced by micro and medium enterprises or homemade industries. Krupuk is not just a popular food or snack, it is a product that has created many new and different jobs started from owners of micro and medium enterprises, to production labor until the distributor and reseller, to food stores and supermarkets, to traditional market and other markets. Now a day, this traditional food has evolved from taste and form to make it more special to eat as a snack or a complementary food. Krupuk is just one of many Indonesia culinary items and is now a symbol of Indonesia’s national motto “Bhineka Tunggal Ika” which means different tribe, culture, food, living but still one nation and thats also what krupuk is. Although the taste, form, and language from krupuk are different from every region in Indonesia it still comes from one type of food.